This is probably the most intimate post I’ll ever write in this blog. Please excuse its lack of structure and the grammatical and spelling errors. I don’t even know how to start it. I may cut into parts cause I have so much to say. “Health and happiness” is a phrase that we hear often and it suggests a strong correlation between the two states and that the two go hand in hand. It means that as long as one is healthy one is happy and if one is happy then one is healthy. Well… that wasn’t my case. Lately I have been sad… very sad. Even when the moment I am is good and I am surrounded by my family or on vacation, I was depressed. I just couldn’t shake off my thoughts which instantly translates to tears and mental anguish. God I have so much to say and don’t know where to start. I guess I want to be clear and get to the point. The point is that I have decided to become a vegetarian today. I want to eventually go vegan but I have to take things step by step. Growing up, I didn’t have any pets and wasn’t an animal lover. I had a classmate who loved animals and thought that was kinda weird. I never gave the situation any thought nor did I ever feel bad about it. I used to even get scared from dogs and would want them locked away when I would visit relatives who had them. I guess It all started when I saw one of those depressing PETA commercials (which I thank God for now because they do raise awareness) and I made a small donation to PETA. The very next day my brother got us a puppy from his friend. My love for animals started growing at this moment. Then my sister rescued a tiny dog from the street that I grow to LOVE so endlessly. Spending time with my dog taught me so much about animals and COMPLETELY changed my perspective. My dog is just like a human expect she doesn’t talk. She cries when I seep without her on the bed. She feels love, excitement, hunger, thirst, sleepiness, energy, and most importantly pain. I remember how she gets one of her paws stuck on one of the carpet threads and she was panicking and crying until we cleared it. I never thought about it but animals are as sensitive to pain as humans are. Animals are just like humans. Except they’re loyal, loving, helpless, venerable, voiceless, and lead miserable lives and die worse deaths. I know I am being cynical here. But to be frank, animals are better than a lot of people on this plant. I digress, but to continue…. I don’t know but I had this thing happen to me during like March of this year where I’d always notice road kills and it would literally break my heart and I would cry and pray about in the car and I just couldn’t shake this imagery out of my head. And if I do succeed in shaking it off, I would a fresh road kill that would bring it all back again. I know horrible things happen in the world to people and babies and I totally support those causes but the reason why I am so passionate about animals is because animals are helpless, venerable, voiceless, and most people don’t even acknowledge their murder yet alone their rights. At least when a human being dies people mourn them and remember them and honor their bodies. But those animals they get ran over, and people don’t even stop to help them and the poor animal could be slowly dying (can’t move) and then another car runs it over again to finish it off. THEN, all the cars run it over until its flattened to the ground. Am i being dramatic?! I know I sound weird to most people. But I know that this must also affect a few people like it affects me. How could I be expected to not have a heart and forget about the cruelty of how we treat animals. A life just like us. A life that is very sensitive to pain. A life for a meal. This issue was so big with me that I even expressed to my boss how I am thinking on becoming Vegetarian soon and he mocked me and tried to stir my anger (tongue in cheek) even though it was apparent how much I got upset about this. Its one thing to eat meat and choose not to be vegetarian but its another thing to mock the murder of poor, helpless animals. At this moment I lost so much respect for my boss and eventually was happy that he fired me (me and him had a conflict of character/philosophies and on more than one occasion he told me to tell him that “he was always right”). Anyways, lately I have been sad and depressed and suffering from extreme mental anguish (especially given the events in China lately). I know that God understands my pain. If I could have this compassion towards his creation then he must have it. If beautiful, GOOD, merciful Jesus could die for us worthless sinners then he must love those animals that I think aren’t evil and are better than many humans. If I, a mere human, could have this tenderness towards animals then God the God of all mercies and grace and compassion must care for them too. I know the Bible doesn’t talk about a specific plan for animals (but it does teach compassion and mercy– I am sure God doesn’t want us to only be compassionate to humans as I am sure its hard to discriminate if you’re compassionate) but I am sure God has one and thats the reason for my hope. I worship a compassionate God who shares my pain. I have been praying hard about this because I lost hope in humanity for a while. I feel guilty and responsible but I am choosing to have faith and trust God. I can’t fathom or fix this cruelty but I could be a small change. Well today I choose to be Vegetarian and to not buy anything leather even as gifts. Friends…. please educate yourself by watching some videos (just type animal cruelty). I am sure its easier to think this cruelty doesn’t exist and go on our merry way but it d0es and I have faith in you. I really do. I love you! Step 11Well you get the picture! * This dummy proof method has been working for me lately cause I am one of those who tend to complicate things and would want to start with the BIGGEST task first and my brain would get overwhelmed and discourage me from doing ANYTHING that day (true story) and It’s not like I could do something fun and care-free either because I feel guilty and like I have pending things to do. If you’re like me and you’re brain tend to conspire against you the same way my brain does then try this method. ** Also when I first wake up my list tend to consist of of stuff my everyday morning routine like Take a shower or Make breakfast. As you can see, those aren’t tasks that I need to accomplish per se but I like tricking my brain that way as I’m crossing those tasks off of my list so I can feel motivated and continue to be productive, just like the image demonstrates. Have you ever felt that your day could have been so much If you had more time in the morning for yourself, instead of almost tripping on your hairbrush and spending 5 minutes looking for your keys when you’re already late. Have you ever felt that those feelings of anxiety and tardiness that we feel in the mornings often accompany us for the rest of the day making us fell…well, anxious and unproductive. I know it may seem like our mornings don’t influence our days but they do. That’s why we need to develop good habits in the morning to help us be and feel our best for the entirety of the day. That’s right! A good morning starts the night before. 2. Wake up early and ON TIME. Set your alarm and make sure you give yourself enough time to do whatever you need to do. Also It helps if you change your alarm sound to a song that gives you serenity or just puts you in a good mood, instead of the typical alarm sounds that our minds associate with “kill joys”. 3. Don’t linger in bed. Getting up right away will make you feel productive and that you have control over your mind and body. Also refrain from lingering in bed because your mind is awake at this point but your body isn’t. Our mind can start playing tricks on us like recalling unpleasant events from the day before and discouraging us about a task that we have to accomplish today. You want to wake up and put your mind to work for you, not the other way around. 4. Hydrate before you caffeinate. 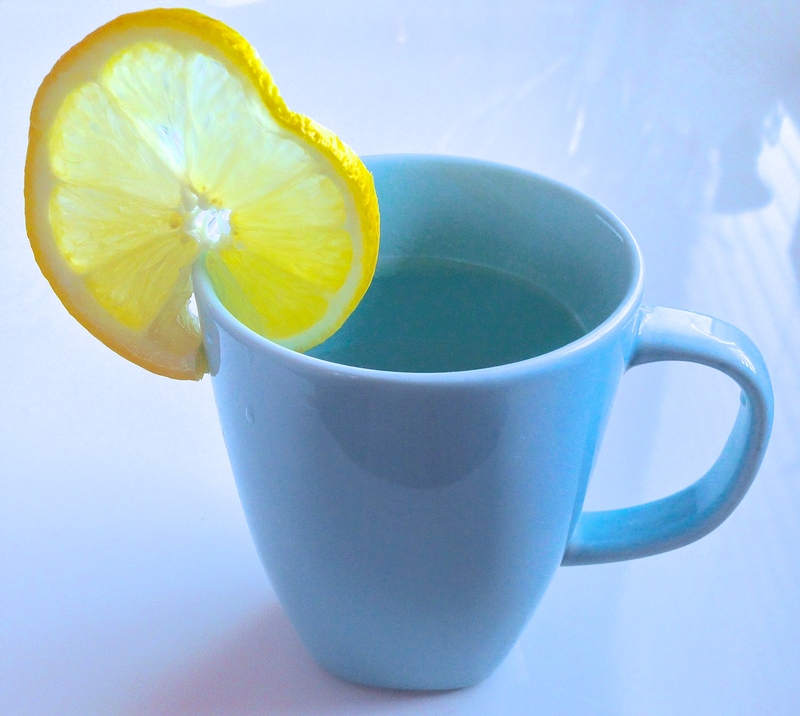 Drink a glass of water first thing in the morning. Set it on your night stand for easy access in the morning. 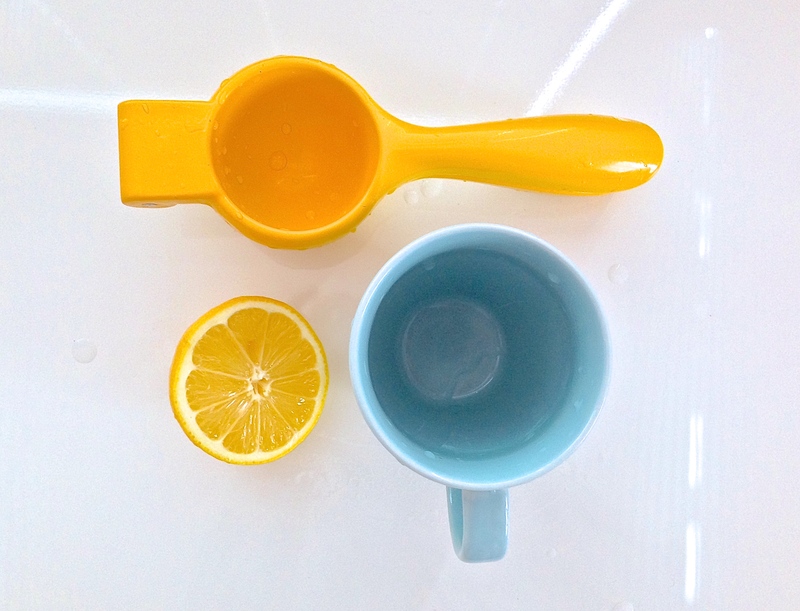 Water with a lemon slice is good and the scent will help wake you up and make you feel refreshed. Then go ahead and drink your favorite cup of coffee or tea. It feels good to do something nice for ourselves in the morning so treat yourself and make something that you’ll enjoy sipping on. 5. Say Good Morning to your loved ones. Giving or receiving little acts of love make us feel good and help remind our minds of what really matters. So show your family and pets some L-O-V-E.
6. Stretch for a minute. We are telling our brains that it’s time to get up and start moving. You can create a morning playlist of audio that you find brings you serenity whether its nature sounds, worship music, music, audio books, or even motivational speakers. Just make sure that whatever you listen to has a good message behind it and be selective of the lyrics because we are trying to condition our minds for the rest of the day. Refrain from loud music. Open up one window (or all windows) and leave the rest of the room dim to let in light and fresh air without compromising serenity. It also helps to engage our other senses by lighting a candle or spraying a calming scent. Drink your favorite cup of coffee or tea. It feels good to do something nice for ourselves in the morning so treat yourself and make something that you’ll enjoy sipping. The most important step in my opinion. This step is like having a meeting with your mind before it starts working. We are setting it on the right path and reminding it of what truly matters. Use this step to reflect on events that were unpleasant from the day before and dump all the anger, the regret, or any other toxic feelings in writing. How many of us dread going to work in the morning? How any of us have to work with people that we don’t see eye to eye with? How may of us downright have horrible bosses and mean coworkers? WRITE ABOUT IT ALL. We don’t want those people in our minds all day. The more we reflect on things that upset us, the quicker we’re going to find ways to deal with them without it affecting out joy and peace. Also you could use writing as a tool to pray by writing letters to God or to plan your day. It also helps if you read something that has a good message in the morning like The Holy Bible or any book that you find inspiring. I use a very cool website called 750words.com to help me reflect and set my mind on the right path in the morning. It acts like a very cool journal and my favorite part is the stats it gives you after each entry because it tells you your mood and other awesome stuff. Don’t skip breakfast! We have to fuel our bodies before expecting them to preform A1. Eat a good nutritional breakfast that you enjoy. 11. Shower and get dressed. Shower and dress your best. Don’t save your good shirt or your perfume. Do something new everyday however small. When we look our best, we feel our best. 12. Do something good for someone else in the morning. Its a universal law: do good, feel good. P.S. It can feel like trying to control our mornings defeats the purpose of it being serene but serenity is a state of mind. Before serenity becomes second nature to us we have to work hard at developing good habits. A. Refrain from using social media in the morning. B. Whatever you do, don’t go back to bed. C. Keep your space clean, organized, and clutter free. Get out there and be a boss!